Dental implants have become so common that the procedure is advertised on television and billboards. Most people who get them do so for cosmetic reasons – to correct misshapen or missing teeth. But scientists at Texas A&M University say there are very good health and wellness reasons to consider replacing missing teeth. 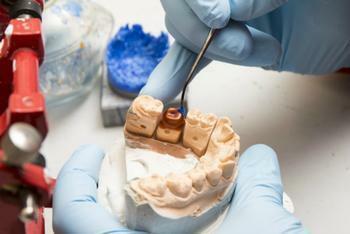 “There’s a common misconception that implants are always about esthetics, and maybe it comes from the branding of practices or how they advertise with ‘implant and cosmetic dentistry,’” said Dr. Sarah Allen, co-director of Clinical Removable Prosthodontics at A&M. In fact, Allen says some implants might look very different from natural teeth. The cosmetic improvement might not be that pronounced. “If you have a single tooth that needs replacement, the best it’s ever going to look is when it’s in its natural form. The support structures and the shape of the root is best with a natural tooth,” she said. That said, Allen suggests when keeping natural teeth isn't an option, a dental implant is. For example, dental implants can help maintain bone levels. If a patient needs dentures, Goodman says placing just two implants in the lower jaw helps to anchor the dentures in place. It also can give the patient added confidence that the dentures won't slip. Another potential benefit is easier chewing, and some patients even say food tastes better. Dental implants are becoming a much more common procedure, with the American Academy of Implant Dentistry estimating some three million Americans have them. That number is said to be growing by 500,000 a year, with a very high success rate. At this point, Goodman says the biggest problem with dental implants is the cost. The bill can be around $3,000 in private practice, and abutment and crown work is extra. If something like a tissue graft becomes necessary, it can cost more than the implant itself. If you are interested in pursuing this procedure, a good place to start is a discussion with your family dentist. He or she can discuss the pros and cons of your particular situation and refer you to a provider, as well as helping you arrive at an estimate of the price.